Fame is set to return to the West End for yet another run, this time at the Shaftesbury Theatre where it will begin an 18-week run from 8 May, following previews from 4 May. Conceived and developed by David De Sliva, with book by Jose Fernandez, music by Steve Margoshes and lyrics by Jacques Levy, it was first seen in the West End in 1995 at the Cambridge Theatre, subsequently playing two seasons at the Victoria Palace, the Prince of Wales, a return season at the Cambridge, and the Aldwych, where it closed last April to make way for Dirty Dancing . It has also completed four national tours and is currently on a fifth. Inspired by Alan Parker's 1980 Oscar-winning film, it follows a group of students at New York's High School for the Performing Arts as they seek to join the acting profession, from auditions to their graduation ceremony. The current touring cast features Abigail Finley, a runner-up in the How Do You Solve a Problem Like Maria? contest, and Hollie Robertson and Darrien Wright, winners of the 2006 season of Strictly Dance Fever on BBC1, who have both previously performed in Footloose � the Musical in the West End. 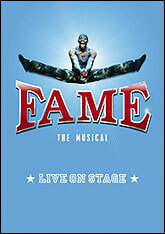 Casting for the Shaftesbury Theatre run of Fame has not yet been announced.